Post-processing is an extremely subjective part of any photographer’s workflow. By putting in days of practice, each photographer eventually develops a characteristic look that can be seen throughout many of their photos, whether that be high contrast, low contrast, highly saturated, monochrome, bright exposures, dark and moody exposures, or anywhere in between. While there is no correct way to process a photo, most landscapes scenes can be readily viewed with the human eye. Because of this, viewers of an image can, in theory, compare the image to the real-life scene to know how far post-processing techniques moved an photo away from “reality.” However, since the Milky Way cannot be seen with the human eye like it can be with modern day digital cameras, the range of different nuanced looks that can be applied to a photo of the Milky Way without being restrained by what it *should* look like is endless. So, with this tutorial, in order to finish off my comprehensive guide to planning, photographing, and post-processing Milky Way photos, I want to take a close look at the potential effects of some of the editing tools that can used to process an image of the night sky, instead of showing only one specific way to process an image. If you are interested, you can find a comprehensive guide to planning Milky Way photography here, and a comprehensive guide to capturing Milky Way photos here. 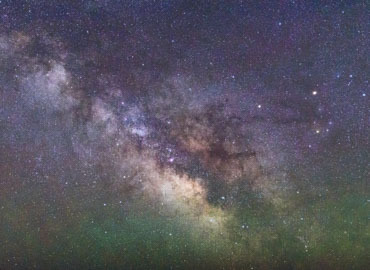 There are essentially three main pillars of post-processing that will affect the appearance of the Milky Way: White Balance, Contrast & Exposure, and Noise Reduction. So, I want to take a step-by-step look at each of them to show how different settings can affect the look of the Milky Way with regard to these three pillars. While any RAW processing software can edit a Milky Way photo, for this tutorial I’ll be using Adobe Lightroom and Adobe Photoshop. For the first part of our tutorial, we’ll be taking a look at the RAW file below, which was shot on a Nikon D750 at 24mm, 16,000 ISO, and f/2.8 for 10 seconds. I originally took this shot with the intention of stacking it with similar exposures, which is the reason for the high ISO and short shutter speed. This base file already has the lens profile correction for my lens added to it, which reduced some vignetting (darkening) that was visible in the corners of the image. Base RAW photo with only lens correction applied. Based on how I processed the photo to my personal taste, the image below was my final result using only Lightroom. As we go through the editing process, I’ll try to show step-by-step how each adjustment affects both the base image and the final results. Keep in mind as we go along, however, that there is no incorrect way to process an image, and no correct order of operations when going through the editing process. Final file after processing with Adobe Lightroom. White balance is the single biggest thing that will affect the overall look of the Milky Way in your photo, so it is always my starting point when editing a night sky photo. Assuming you shot your night sky image as a RAW file—which is highly recommended due to how much flexibility it gives in the editing process—White Balance does not need to be set in-camera when you are out in the field. White Balance, which is a color temperature measured in degrees Kelvin (K), ranges from blue at the cool end of the spectrum and orange on the warm end of the spectrum. In Lightroom’s Develop Module, the main White Balance slider is labeled as “Temp.” Another slider, which balances between green and magenta coloring, is labeled “Tint” and is located just below the Temp slider in the Develop Module. Just based on personal taste, I find that I tend to make the White Balance relatively neutral in most of my Milky Way photos, but ultimately push the overall coloring slightly towards the blue and magenta ends of the White Balance spectrum. Depending on the ambient lighting conditions at my shooting location, the look I prefer normally results in a Temp of somewhere in the 3,700 K to 3,900 K range, with the Tint slider being set somewhere between +5 and +15. The photo below has a Temp of 3,786 K and a Tint of +10. These settings gave a good balance between a slightly blue sky, a yellow core of the Milky Way, a magenta colored Lagoon Nebula in the central core of the Milky Way, and the green airglow that was present on the night I was shooting. Base RAW file with neutral White Balance. Since all of this coloring is extremely subtle in an unedited RAW file, when choosing my White Balance I will first crank up the Saturation and Vibrance of the image as high as possible. Doing so exaggerates the colors in the image, allowing me to easily see the effects of a subtle change of the Temp or Tint sliders. Upping the Saturation and Vibrance to +100 gave me the image below. Unprocessed RAW file with boosted Saturation and Vibrance. For the sake of comparison, if I were to have chosen a Tungsten White Balance, which sets the Temp slider at 2,850 K, or Daylight White Balance, which sets the Temp slider at 5,500 K, I would get the images below. 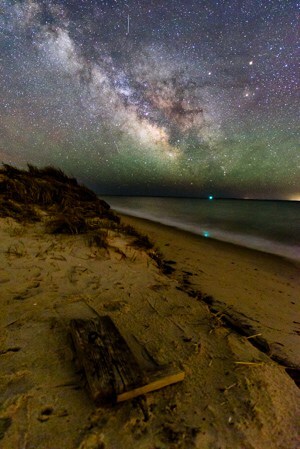 Note that not only does the overall color of the sky change, but the subtle colors in the core of the Milky Way, as well as the green airglow, are overpowered. Unprocessed RAW file with Tungsten WB (left) and Daylight WB (right). I will openly admit that designating one of the 3 Pillars as “Contrast and Exposure” is unbelievably broad. However, when focusing on strictly the Milky Way in a night sky image, Contrast and Exposure are very closely linked and are the major factors that affect the appearance of the Milky Way in your photo once you have chosen your White Balance. 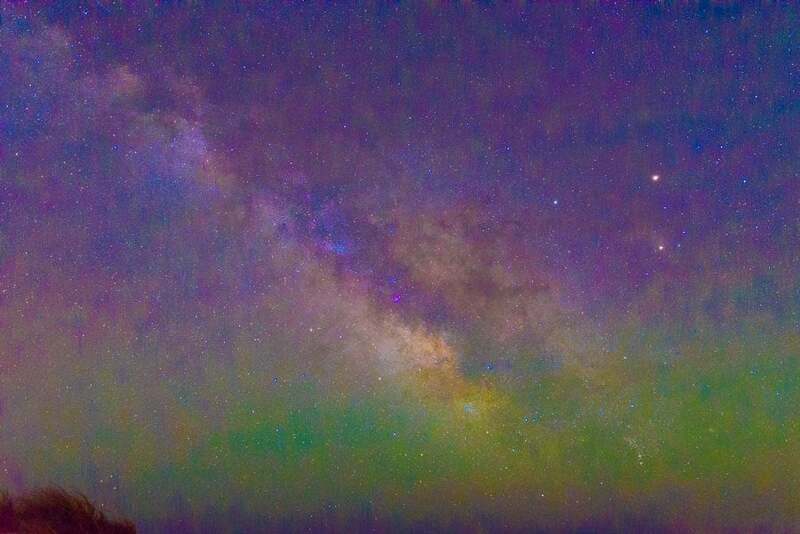 Given that it is meant to be processed, an unedited RAW photo of the Milky Way looks washed out and offers little detail of our main subject. So, each tweak we make going forward has the end goal of using contrast to bring out the desired amount of detail in the Milky Way, while also maintaining a correct exposure. When adding contrast to a Milky Way photo, I tend to do it gradually, evaluating how each adjustment and small tweak effects the overall image. After adjusting White Balance, the Blacks slider in Lightroom is typically my next stop when processing a Milky Way image. Not only does it deepen the colors in the image, but it also serves as a way to bring out the subtle colors in the Milky Way and provide a bit of noise reduction to the sky. While adding contrast via the Contrast slider would have a similar effect with regard to bringing out colors, it would also brighten the highlights in the image at the same time. By using the Blacks slider, we can affect only the darker portions of the image for now, giving us more nuanced control. For the final processed image, I dropped the Blacks slider to -60. Blacks slider set to -60 in Lightroom. If I were to take away that Blacks adjustment from the final image, it gives the Milky Way a look with less contrast, which may look washed out to some, but to others may give a more dreamy and ethereal feel. Final Lightroom file with no Blacks slider adjustment. In a similar way as the Blacks slider, the Whites slider in Lightroom allows us to selectively brighten parts of the image, effectively creating contrast when used in tandem with the Blacks slider. The Whites slider is typically what I tweak right after using the Blacks slider so that I can see the cumulative effect they have on the Milky Way. The image below shows our RAW file with the Whites slider set to +30. Whites slider in Lightroom set to +30. Also, here is what the final Lightroom image would look like if the Whites had not been raised. Leaving the Whites slider at 0 does not have a huge overall effect in the image, but some of the glow of the Milky Way is removed, making it look slightly flatter. Final Lightroom file with no Whites slider adjustment. After selectively adjusting contrast using the Blacks and Whites sliders, I used the general Contrast slider to further boost contrast in the image. 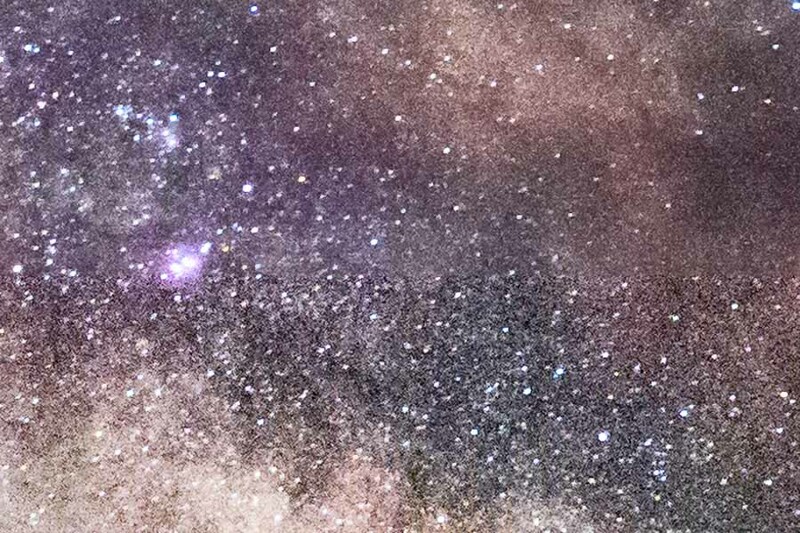 By bring up the Contrast slider to +50, the Milky Way’s details become more isolated from the overall exposure, seemingly deepening the sky and the dust trails in the core of the Milky Way. Contrast slider set to +50. Without this contrast adjustment, the Milky Way in the final Lightroom image would have had slightly less punch and separation between the dark and light portions of the sky. Final Lightroom file with no Contrast slider adjustment. At this point in the editing process, we can see that the overall exposure of the Milky Way is a bit dark due to all of the adjustments made to add contrast. The dense path of stars in the core of the Milky Way does not glow at all, so I decided to raised the Exposure slider to +0.40 stops to get the overall brightness of the image closer to where I would want the final product to be. Exposure slider in Lightroom set to +0.4. Without this increase in exposure, the final file of Milky Way would look like it does below. Final Lightroom file with no Exposure adjustment. 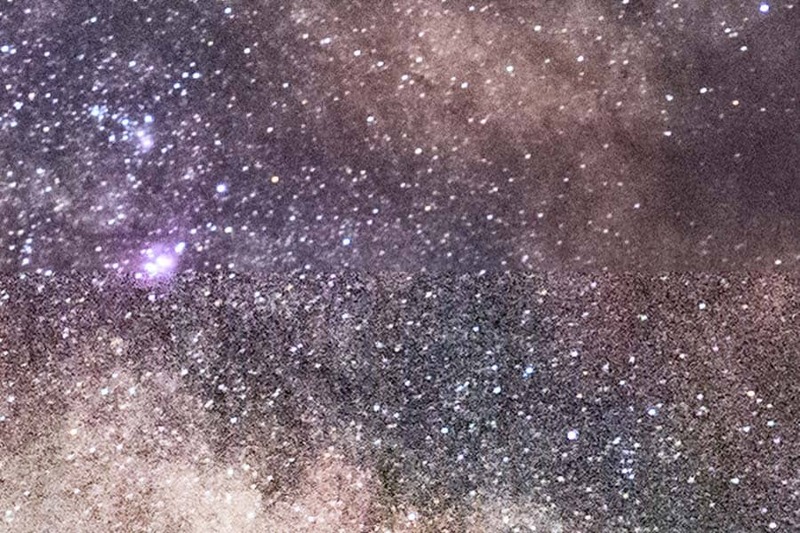 Although its designed purpose is to bring back detail in areas of an image affected by atmospheric haze or fog, the Dehaze slider in Lightroom effectively adds some serious contrast and punch to the Milky Way in night sky photos. Hidden away from the main panel in the Develop Module, Dehaze can be found in the Effects menu of the Develop Module. In addition to adding contrast, Dehaze also helps to bring out some of the colors in and around the Milky Way, including the green airglow in the bottom of the image. I bumped the Dehaze slider to +40, which was probably the most drastic adjustment thus far other than setting the White Balance. I try to carefully evaluate how much I increase the Dehaze slider, however, because pushing it too far makes the Milky Way look a bit grungier than the look I’m hoping for. Dehaze slider in Lightroom set to +40. Without the increase in Dehaze, the final image has noticeably less contrast and color. Final Lightroom file with no Dehaze adjustment. A Curves adjustment is a powerful tool that gives you a large amount of nuance control when editing a Milky Way photo. If you know how to use it properly, many of the adjustments above could be mimicked by making a Curves adjustment in Lightroom or Photoshop, as it allows you to selectively adjust shadows, midtones, and highlights of an image. When trying to add contrast to an image, you will want to make the diagonal line extending from the bottom left to the top right of the histogram overlay into an S-shape by dragging a point on the left half of the histogram down and dragging a point on the right side up. The more pronounced the S-shape, the more contrast that will be added to the image. In playing around with Curves adjustments in both Lightroom and Photoshop in the past, I have actually found the Photoshop Curves adjustment to yield better results. Because of this, I typically don’t use the Lightroom Curves adjustment other than to check to see if either the “Medium Contrast” or “Strong Contrast” Curves presets yield an effect on the image that I like. If I have a more complicated image that requires only adding a Curves adjustment to a specific portion of the photo, I will bring the file into Photoshop and combine the Curves Adjustment with a Layer Mask. For our Milky Way-only image, I used the “Strong Contrast” preset to give a little more punch to the core of the galaxy. The Highlights slider was one of the last ones that I touched while processing this Milky Way photo. After looking at the overall exposure, I wanted to get a little bit more glow out of the brighter parts of the Milky Way, so I boosted the Highlights slider to +30. This honestly didn’t make an enormous difference to this image. 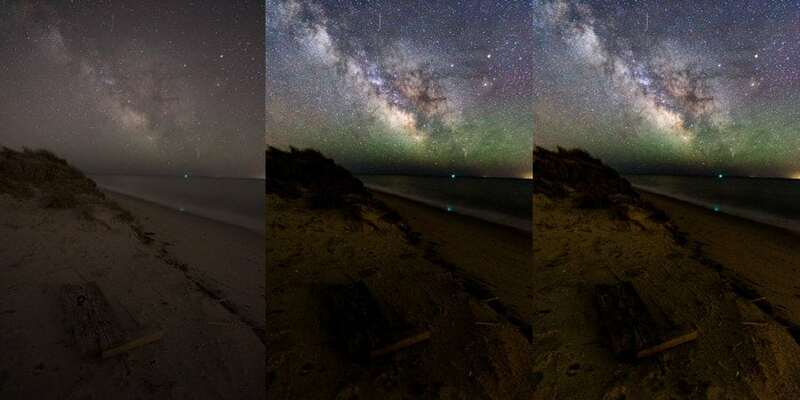 However, depending on the photo, the Highlights slider can help to be a fine adjustment tool to either add a little extra glow to the Milky Way, or to bring the exposure of the brightest parts of the image to avoid a dense area of stars to be blown out. The Clarity slider is one of the more powerful tools in Lightroom, the effect of which can essentially be summed up as “edge contrast.” Boosting the Clarity slider provides punch and a more three-dimensional look to an image, and a little can go a long way. In Milky Way photos specifically, the dragging the Clarity slider to the right can make the stars seem to pop a bit more, while dragging it to the left is another way to give a dreamy, ethereal look to the sky, similar to an Orton Effect (which is discussed further below). The image below shows the RAW file with the Clarity boosted to +40 to add a bit of pop to the stars. Clarity slider in Lightroom set to +40. And for a more ethereal look, this image below is the final Lightroom file with Clarity set to -40 instead of +40. Clarity slider in Lightroom set to -40. Since Milky Way photography is a constant balancing act between keeping your camera’s ISO low enough to get a relatively clean image and keeping your shutter speed short enough to prevent noticeable star trailing, noise reduction is often a necessary step in a night sky photography workflow. The Improve Photography article 5 Great Ways to Reduce Noise in Your Photos gives an in-depth comparison of the effects of different types of noise reduction. The type of noise reduction you choose for your Milky Way photo may largely be dependent on where you ultimately want to display your photo. The photos that I plan to post on Facebook or Instagram will be compressed and, most likely, will be viewed on a small cell phone screen. If this is the case, I put very little effort into noise reduction and just boost the Luminance slider in the Noise Reduction Panel of Lightroom’s Develop Module to somewhere between +10 and +20. If I know that the end goal of my photo is for it to be printed, I typically take noise reduction a bit more seriously because, depending on my print surface, the noise can end up being a lot more apparent. In these situations, I have two go-to methods. As detailed in 5 Great Ways to Reduce Noise in Your Photos, image stacking using a median filter in Photoshop is an extremely effective way to increase the signal-to-noise ratio in your photo. In Milky Way photography, stacking enhances faint details in the galaxy while smoothing out noise in the final photo by identifying the random luminance and color noise in each exposure and removing it. It can be time-intensive, but it is well worth the effort. Image stacking before (below) and after (above). For a sky-only photo with no clouds, stacking is my preferred technique because the alignment process is quick and easy. With clouds or a foreground included, however, Photoshop can sometimes get confused about which pixels are supposed to be aligned, forcing you to align exposures manually. (If you do run into this problem, check out this tutorial on how to manually align sky exposures.) Lastly, image stacking essentially lets you to cheat in that aforementioned balancing act between your ISO and shutter speed, because it allows you to both boost your ISO and reduce your shutter speed. This results in more noise, but more pinpoint stars. After image stacking, your stars will remain pinpoint, but your noise will be greatly reduced. Another effective way to reduce noise in a Milky Way photo is to use a combination of Nik Dfine (Google’s free noise reduction Photoshop plug-in) to reduce noise, and a luminosity mask to selectively choose where to apply that noise reduction. If you are unfamiliar with luminosity masks, check out this in-depth article written by Brian Pex to get you started. After loading your Milky Way image into Photoshop, open Nik Dfine and either let it analyze the noise profile in your image automatically, or do so on your own. Once Nik Dfine has finished analyzing the noise, close the plug-in and wait for Photoshop to create a new layer with the noise reduction applied. In all likelihood, Nik Dfine will do a fairly good job of smoothing out much of the noise in the image, but will also blur the boundaries between stars and the dark sky around them. In order to keep those edges crisp, we have to turn to luminosity masks. Nik Dfine analyzing the noise profile of the image. Invert the mask by using CMD/CTRL+I. Before (below) and after (above) using Nik Dfine and luminosity masks to reduce noise. Aside from these three main pillars of Milky Way post-processing, there are an endless amount of additional editing techniques that can be used to perfect your night sky image. While it would be impossible to dig in to every possibility here, there are a few common ones that are worth being aware of. To create a truly compelling image with the Milky Way, it’s important to include some kind of foreground or midground in the scene to add some additional interest to the image. 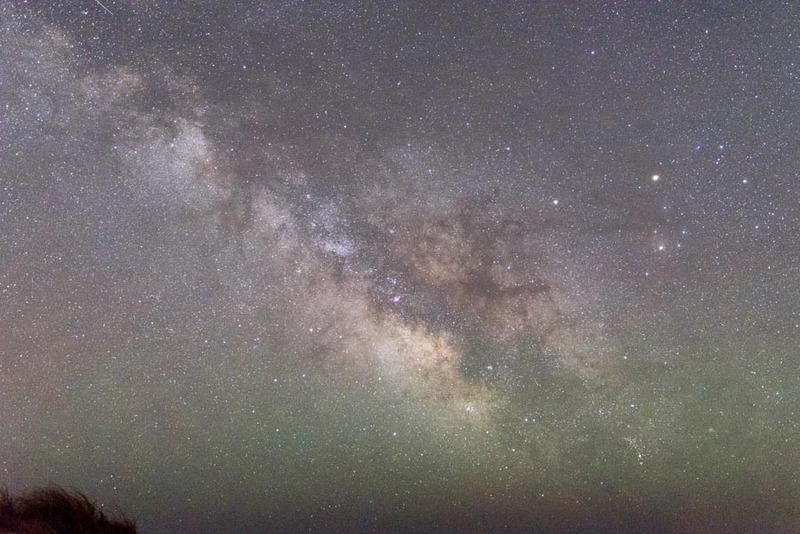 While the Milky Way itself is spectacular to stare at, it begins to look the same in each image when shown as its own composition instead of as a part of a larger shot. For the image below, I used most of the ideas mentioned above to get the Milky Way looking the way I wanted before switching my focus to the foreground. While this process made the Milky Way look great, all of the added contrast resulted in a very dark foreground. To combat this problem, I raised the Shadows slider in the Develop Module in Lightroom to +100, which did help a bit, but not enough for my liking. to -100. Keep in mind that these were the sliders in the Adjustment Brush panel and not the Basic Panel of the Develop Module, so they affected only the area of the foreground that I painted over. This shot was made all with one exposure on a Nikon D750, which not only handles high ISO settings very well, but also has fantastic dynamic range, meaning that the sensor can capture a wide range of shadows and highlights all in one exposure. Further, the D750 is able to capture detail in the shadows of an image without also introducing large amounts of noise. If using a camera that didn’t have these qualities, however, I would instead capture the sky with a proper exposure in one scene and the foreground with a proper exposure in another. While this strategy takes a bit more effort because care needs to be taken to blend the two exposures together in Photoshop with layer masks, it also yields a cleaner image because each exposure can be captured while taking noise into consideration. Regardless of your chosen method to enhance the foreground in your image, keep in mind that your Milky Way photo was taken at night. To keep the image looking “realistic”, if that is your goal, the foreground shouldn’t be as bright as it would be in a daylight image. Click Filter>Other>Minimum and choose a radius of approximately 0.5. In the dropdown menu, choose “Preserve Roundness”. Before star reduction (left) and after (right). As mentioned in the lens selection section of the Ultimate Guide to Planning Your Milky Way Photography, some lenses suffer from saggital astigmatism, the effects of which appear as bright wingtips on either side of stars on the outer portions of the image. The degree to which this astigmatism can be seen varies by lens. However, if the astigmatism is noticeable enough to take away from the quality of the image, check out this video tutorial made by astrophotographer Tyler Sichelski over at Lonely Speck for a way to correct saggital astigmatism in Photoshop. Before (left) and after (right) apply a subtle Orton Effect to an image. Post-processing is an extremely subjective process. 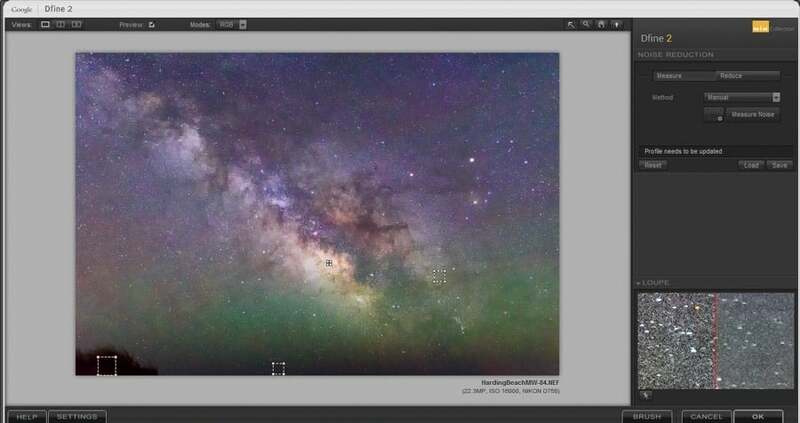 There is no right or wrong way to edit a photo of the Milky Way, but hopefully this tutorial was able to help show some of the many different post-processing tools that are currently available to photographers that can help to make your Milky Way photos come alive. Milky Way photography can be an awe-inspiring and extremely tiring endeavor, but one I personally have found to be very rewarding over the past few years. I hope this has given some insight into how to put the finishing touches on all the effort that goes into making an image of the Milky Way. Good luck!